Today is my last share from Vintage Quilt Revival. I've had so much fun posting about the quilts each week. I think it's hard to buy a book sight unseen and hopefully by seeing the collection of all the projects, you can get a good idea of what's inside. As I've mentioned in the past, the book contains three samplers. These are the only projects Katie, Lee and I didn't design months ahead of time. We did know that we would each do something different in regards to the fabrics and layout. 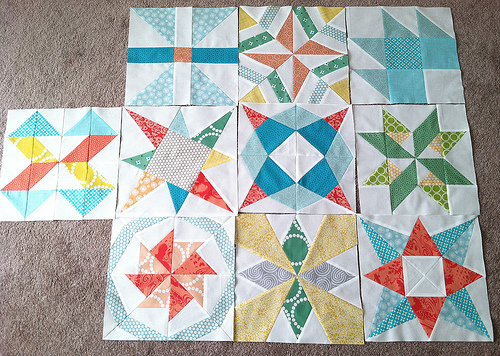 Katie made her sampler in solids, Lee used a fabric collection and I made mine scrappy. Lee and Katie will talk about their samplers on their blogs next week. I took loads of photos as I was working on this quilt, and I'm so happy I did so I can share some with you today! When I was pulling fabrics, I decided to go with a softer collection of colors. (Side note: I really have to say, Lizzy House makes the best blenders and you will see a lot of her fabrics mixed into this quilt.) I knew I was going to use white as my background all over. If you've made a sampler (or any quilt really), you probably understand what I mean when I say that making blocks and watching them come together is pretty addictive. I'd make a few and lay them out. Then get so excited that I'd make a few more. And the more it grew, the faster I wanted to sew and finish. Once I had all 20 blocks finished, I was so, so happy with how it looked! I'm glad I took a photo just before basting, because as much as I enjoy a warm and crinkly quilt, I love the look of a smooth one as well. And here's the finished quilt from the book! A larger quilt perfect for cuddling! I have a couple other fun things to share today. 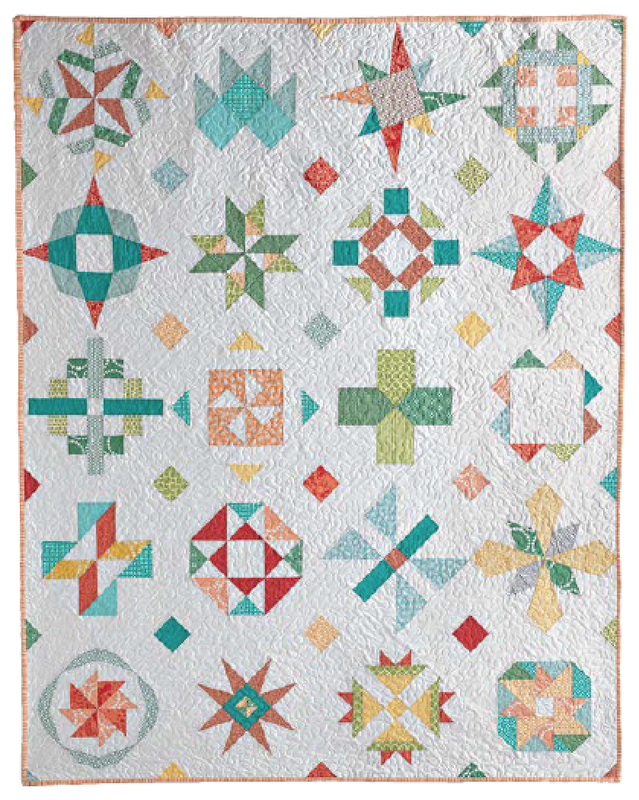 Sukie from Don't You Know Who I Am is hosting a Vintage Quilt Revival Block-Along beginning January 21st. She'll be making 2 blocks a week. If you've ever thought about making a sampler or even just a few blocks for a different project, this would be a fun way to sew along with others. And speaking of Sukie - she is also hosting Sewtopia, a big sewing retreat in Salt Lake City from Nov. 6-9, 2014. You can find out more information, including important registration dates, on the Sewtopia website! One last thing and I promise I'm done! If you haven't checked out our "official" book website, www.VintageQuiltRevival.com, be sure to click on over. We have some technical details about using the book CD, information for shop owners about potential classes, and any project/block errata that comes up. Happy sewing everyone!